With the advent of a number of pastors, seeking to enhance their names by any means, Bonsam’s claims are not far-fetched. Some emerging pastors with relatively young ministries have bought expensive properties and command a huge following in Africa. 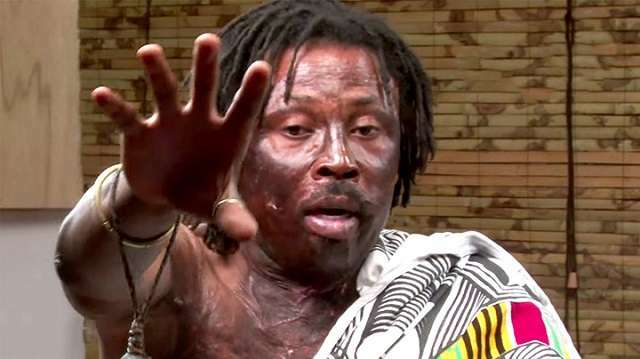 The much-dreaded fetish Nana Kwaku Bonsam speaks with authority, he speaks openly and publicly dares any of his critics to challenge him in a battle of supernatural powers. The Ghanaian resides at his his shrine at Sa-Peiman, a village on the outskirts of Nsawam in the eastern region of Ghana. His god is called Kofi-Kofi, and is the one who provides him with supernatural powers that are desperately needed by different pastors from all walks of life. A Ghanaian newspaper interviewed Nana Kwaku Bonsam witnesed hundreds of top-of-the-range cars parked at his shrine, among them were prominent business people and celebrated church founders. Consultation costs US$5 000 which excludes the cost of the rituals. Part of the rituals incorporates hanging a cat alive, slaughtering several fowls, a white dove, pigeons and goats and then spills the blood on his god. “I’m a fetish priest; a powerful one of course, and I use my powers to heal the sick, help people who want to travel abroad, help traders get better sales, protect people from fraudsters. I dis empower witches and wizards or help people who have one problem or the other. “I am well-known for the wonders I perform in this country so I receive people from all parts of the country and even people from other countries,” he said in an interview with Ghana’s Daily Guide. The king of ‘juju’ is no stranger to miracle money. The sangoma claims he has prominent pastors approaching him seeking powers to start prominent churches and perform miracles. The sangoma offers many powers. “I give some the power to heal, others to see into the future and or the past, or do anything I want them to do. It helps their churches get more members who always want to see signs and wonders,” he revealed. But he is against hypocrites. “I am also against those who have gone for powers from other shrines yet preach against us and do not abide by our rules. Some of them are using the church for fashion parade. Several Ghanaian pastors and bishops have previously challenged Nana Kwaku Bonsam, but they all couldn’t take the risk. Prophet Nicholas Osei alias Kumchacha challenged the renowned fetish priest for a spiritual battle after arranging to meet at Tema-based Adom FM’s premises in Ghana. However, a mammoth crowd that besieged the premises to witness the grand “spiritual showdown” got disappointed after Prophet Kumchacha made second thoughts at the last minute and failed to turn up. Some Africans believe in mixing religions in when seeking solutions to their problems.